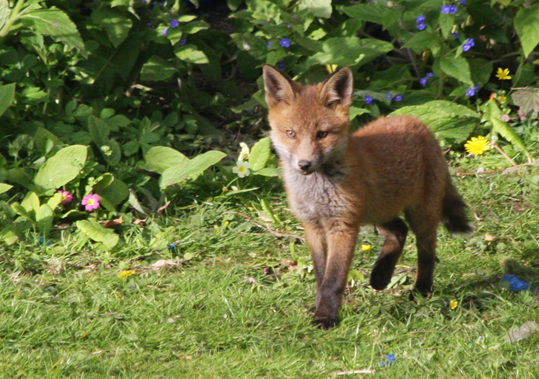 Every evening over the past few nights I've been watching a family of foxes play in my garden. It has mostly been too dark to take good pictures, but they came out earlier the other day and I managed to get this photo in sunlight. There is only one cub in the family. He is absolutely full of beans and has cute little black feet and ears. I shared on Facebook a photo taken at twilight earlier in the week, which got more than 100 likes. However, when I tried to name him by tagging the photo, Facebook for some reason decided to name him first - as Intrepid Fox, the name of an old Goth and punk pub in London. Intrepid seems a good fit though, so Intrepid he will remain. The rest of the family are three adult foxes - probably one of them is an aunt or older sister of the cub. The cub and one of the adults are fine and healthy, but I'm a bit worried about the other two. One has a limp and the other is very mangy with no fur on the rump. Not really sure what I can do though as they are wild animals and I'm not sure it is a good idea to put out food for urban foxes.